From diagnosis to treatment, our team of sarcoma specialists utilize the latest technology and treatment protocols with a continued goal of positive outcomes and quality of life for each and every patient. Thank you for entrusting your health in our care. If you or a loved one has received a diagnosis of sarcoma, our comprehensive oncology team of specialists at West Cancer Center & Research Institute will work with you to formulate an individualized treatment plan utilizing the most cutting edge treatments and technology. Our goal is also to provide resources and information to help you better understand and manage your diagnosis. 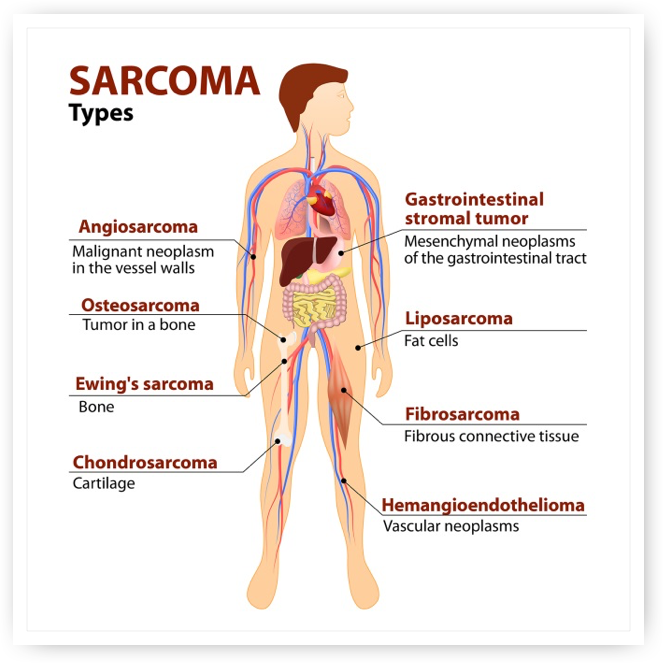 Sarcomas are rare cancers that begin in muscle, bone, fat, cartilage, blood vessels, or connective tissue. They can occur anywhere in the body. Sarcomas are divided into two main groups: bone sarcomas and soft tissue sarcomas, but there are more than 50 types of sarcomas. The tumor is 5 centimeters or smaller and is low grade. The tumor is larger than 5 centimeters and is low grade. The tumor is 5 centimeters or smaller and is intermediate or high grade. The tumor is larger than 5 centimeters but not larger than 10 centimeters and is intermediate or high grade. The tumor is larger than 10 centimeters and is intermediate or high grade. The tumor has spread to nearby lymph nodes or other parts of the body. Symptoms can vary depending on the type of sarcoma and its location. If you are experiencing any of these symptoms, we urge you to speak to your provider as soon as possible for further examination. *Symptoms may not always be apparent; often, the only sign of sarcoma is a lump. A biopsy is the removal of a small amount of tissue for examination under a microscope. Other tests can suggest that cancer is present, but only a biopsy can make a reliable diagnosis. A pathologist is a doctor who specializes in interpreting laboratory tests and evaluating cells, tissues, and organs to diagnose disease. There are different types of biopsies. For a needle biopsy, a doctor removes a small sample of tissue from the tumor with a needle-like instrument—usually a core needle biopsy and, less often, a thin needle biopsy. This may be performed with the help of ultrasound, CT scan, or MRI to precisely guide the needle into the tumor. In an incisional biopsy, a surgeon cuts into the tumor and removes a sample of tissue. In an excisional biopsy, the surgeon removes the entire tumor. Second surgeries are often needed after an excisional biopsy because the tumor may not have been completely removed. Because STS tumors are uncommon and there are many different types of STS, it is important to have an expert pathologist review the sample of tissue removed to appropriately diagnose a sarcoma. It is important for surgeons who have expertise in sarcoma to perform the surgery. A CT Scan creates a 3-dimensional picture of the inside of the body using x-rays taken from different angles. A computer combines these images into a detailed, cross-sectional view that shows any abnormalities or tumors. A CT scan can be used to measure the tumor’s size. Sometimes, a special dye called contrast medium is given before the scan to provide better detail on the image. This dye can be injected into a patient’s vein and/or be a liquid the patient must drink. An MRI uses magnetic fields, not x-rays, to produce detailed images of the body. MRI can be used to measure the tumor’s size. A special dye called a contrast medium is given before the scan to create a clearer picture. This dye can be injected into a patient’s vein. MRI is a key test for doctors to decide whether a biopsy is necessary in cases of possible STS as well as to guide any surgical procedure. An MRI is generally viewed as necessary before any surgical procedure is performed. 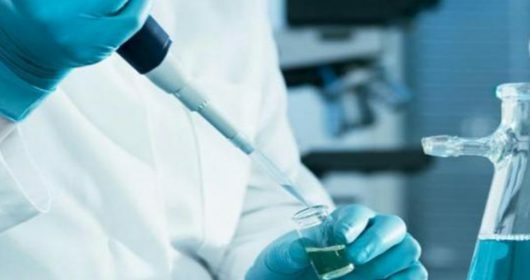 Your doctor or the pathologist looking at the sarcoma may recommend running laboratory tests on a tumor sample to identify specific genes, proteins, and other factors unique to the tumor. Results of these tests will help decide what the treatment should be, because each sarcoma can be as different from one another as breast cancer is different from colon cancer. A PET scan is usually combined with a CT scan (see above), called a PET-CT scan However, you may hear your doctor refer to this procedure just as a PET scan. A PET scan is a way to create pictures of organs and tissues inside the body. A small amount of a radioactive sugar substance is injected into the patient’s body. This sugar substance is taken up by cells that use the most energy. Because cancer tends to use energy actively, it absorbs more of the radioactive substance. A scanner then detects this substance to produce images of the inside of the body. This technique can be used to look at both the tumor’s structure and how much energy is used by the tumor and normal tissues. This information can be helpful in planning treatment and evaluating how well treatment is working, but it is usually not be performed in all cases of known or suspected STS. An ultrasound uses sound waves to create a picture of the internal organs. An x-ray is a way to create a picture of the structures inside of the body, using a small amount of radiation. X-ray is particularly useful for bone sarcomas, but less valuable for soft tissue sarcomas. Your sarcoma treatment plan will vary depending on multiple factors including, but not limited to, your stage of diagnosis, as well as the location of your cancer. Your dedicated team of cancer experts will discuss your treatment options and plan with you, allowing you and your loved ones to consider all possible treatment options for your diagnosis. Radiation therapy is the use of high energy beams to kill cancer cells. With some sarcomas, radiation is given before or after surgery to help reduce the risk of the cancer coming back. Radiation therapy can also be used to relieve symptoms from cancer. INTENSITY-MODULATED RADIATION THERAPY (IMRT): a highly focused radiation therapy that reduces your treatment time with a 360-degree rotation around your body with a linear accelerator to target your disease with speed and precision. Chemotherapy and other medications can be an effective way to control your cancer and relieve your symptoms. Ask your physician if a clinical trial might be an option for your specific cancer. Surgery is the removal of the diseased tissue from the body.